As a former Derventio eXcel and Great Britain Junior swimmer, Shelly Peat, now Duty Manager at Alfreton Leisure Centre, is passionate about getting people in the pool. She believes that technology has a key role to play in increasing participation in the sport, and has been impressed by the way the Swimtag system, trialled and rolled out at the Amber Valley venue, has helped in that process. 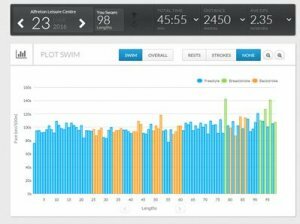 Alfreton Leisure Centre has been using Swimtag for more than two years. If you're one of those swimmers who wants to know how far you've swum but forgets to count the lengths, or if you get bored because you feel like you've got nothing with which to compare your regular swims, then the ideal assistance is now at hand. Swimtag, the water based equivalent of a Fitbit-style wristband, is becoming an increasingly popular way for leisure swimmers to record their activity for review on mobile phone, laptop or desktop once back on dry land. It's a programme that's now been in place at Alfreton Leisure Centre for more than two years after a successful trial - and is also in operation at a number of other sites across the county. It works on a simple premise, but first you must be a member, after which the service is free to those who have signed up. Swimtags are handed out at reception after first being 'swiped' on a specific computer to set it up for each swim. If the swimtag is flashing you're good to go, if it stops then the battery has run out and you can swap it for another band. 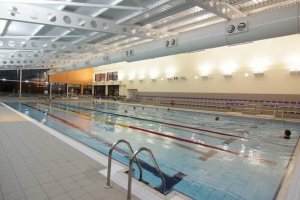 The pool at Alfreton Leisure Centre is one of several across Derbyshire offering Swimtag. The tags are set up so that they know the length of the pool you are swimming in. It works out how many lengths you have done and picks up what stroke you are doing, although it can take a while to 'recognise' your strokes when you first use the system. As soon as a swim is finished and the user has changed, they take it back to reception and their information is put onto the computer. Members can then register and log on to the Swimtag website, where it will bring up the swim, giving a whole host of details such as the number of lengths swum, distance swum, average time per length, time of individual lengths and average distance covered by stroke, among others. A screen shot of a session report. Swimtag's introduction has been well received at Alfreton, says Shelly Peat, who co-ordinates the system on the leisure centre's behalf. "Once in the pool, you can just keep on swimming, and the only thing you need to remember is to touch the wall at both ends so it registers the completion of a length," she added. "It means you don't have to count your lengths and you can let the Swimtag do the thinking for you, so you can just enjoy yourself. "The feedback from it has been very good. It obviously won't be for everyone, but people like the fact that they can get their session up on screen and analyse it and have a benchmark on which they can try to improve. Different colours show the different types of stroke used." 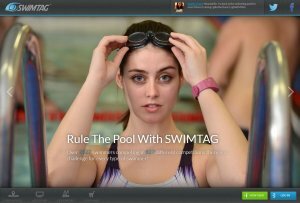 New and experienced swimmers have found Swimtag useful. Currently, there is no way of checking how many lengths you have done until you log on afterwards - a device is being trialled that lets you do so - meaning if you want to compare your swim another of the same distance swum previously, you would still have to count your lengths. But Shelly points out there are several other ways that a swimmer can utilise the Swimtag, whether the user has just taken up swimming or is a someone who visits a pool several times a week. She said: "I definitely think it's a good motivating tool, especially as you can get involved in specific challenges that you can set yourself or through one of the ones we set at the pool. 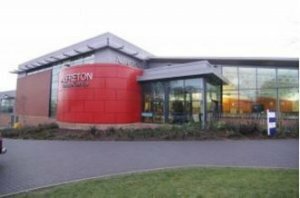 The exterior of Alfreton Leisure Centre. 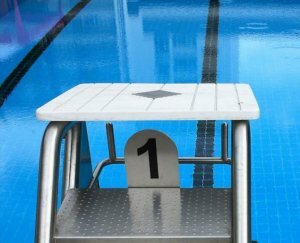 "A customer might challenge themselves to swim a certain distance in a month – and it will add up the distances for them. Then there are our challenges, which last month was to swim 100m front crawl in the quickest time possible and this month it is a 1k challenge, so we can vary it, with results on a leaderboard. "There are other devices to use for 'dry sports' but this works well for in the pool. I think it actually works better for casual swimmers than elite ones. Elite swimmers already have a coach, but this acts as a push to those casual swimmers and, in effect, acts as their coach. "It has definitely brought more people to us when it comes to swimming and new members are always introduced to it by our staff. It's also a good way of keeping people interested once they have taken it up." If you are interested in trying out Swimtag, it is currently available at the following Derbyshire facilities. Alfreton Leisure Centre, Buxton Swimming and Fitness Centre, Glossop Swimming Pool, New Mills Leisure Centre, Ripley Leisure Centre, William Gregg VC Leisure Centre. To find swimming opportunities across the county, from beginner to elite level, visit the swimming pages of the Derbyshire Sport website.